Bitter exchanges between Macedonia’s government and the opposition, including wiretapping and claims of million-euro bribes, have pushed the Balkan state into a deep crisis that could further hamper its already stalled bid for EU membership. Since the beginning of the year, conservative Prime Minister Nikola Gruevski’s government and the centre-left opposition have communicated only through public exchanges of accusations. The crisis has not only undermined Macedonia’s already weak institutions, but it also sparked concerns in the 28-nation European Union, which it is seeking to join. “It is a dangerous political game that causes disastrous collateral damage. The already fragile institutions are further weakened and passions ignite,” political analyst Biljana Vankovska told AFP. As soon as the crisis started, Brussels voiced alarm over the “deterioration of political dialogue” in the former Yugoslav republic and called for a thorough investigation. In January, the government filed a complaint against opposition leader Zoran Zaev and several other people for espionage and violence against officials. Zaev rejected the allegations, and in turn accused the government of wiretapping at least 20,000 people, including politicians, journalists and religious leaders. On Thursday, he also accused Gruevski of accepting a 20-million-euro ($22-million) bribe from Chinese firms to grant them concessions to build motorways. Zaev heads the centre-left opposition Social Democrats (SDSM), which have been boycotting parliament for almost a year, alleging electoral fraud in April 2014 polls. He has called on the prime minister to resign, form an interim government and organise “fair and democratic” early elections. The country has been governed in a delicate power-sharing deal between Macedonians and ethnic Albanians since the end of a seven-month conflict in 2001 between the country’s armed forces and ethnic Albanian rebels. Ethnic Albanians make up around one quarter of Macedonia’s population of 2.1 million. Macedonia obtained EU candidate status in 2005, but is yet to begin accession talks, partly due to opposition from Greece. Athens denies its neighbour the right to use the name of Macedonia, arguing that it implies a claim on the northern Greek region of the same name. Macedonia is also tormented by economic hardship with unemployment reaching 28 percent. 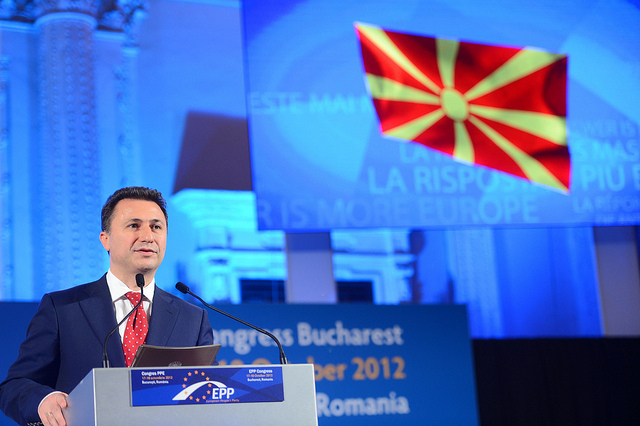 In a sign of the febrile political atmosphere, Gruevski even warned that the opposition might make moves that could provoke “possible inter-ethnic destabilisation” between Macedonians and ethnic Albanians. “The situation is very serious … it is of the utmost importance that EU accession talks be opened as soon as possible,” Ivo Vajgl, a European Parliament rapporteur for Macedonia, told reporters recently. “The rule of conservatives showed that the elites still lack political culture and that basic principles of democracy were violated (and) an authoritarian populist system was introduced,” warned political analyst Nano Ruzin. Meanwhile, faced with a loss of support, Zaev has been desperately trying to seize the initiative. “The opposition is looking for a life jacket, a way to destabilise the government or to attract the attention of the international community which does not seem interested in the situation in the country,” Ruzin said. Some analysts criticise Brussels’ policy towards Skopje and the stalling of accession talks. The EU has “complicated things” by failing to grant a date for the accession talks to start, said political analyst Aleksandar Dastevski. Most analysts believe that it would not be possible to resolve the crisis without help of the international community. Representatives of the rulers and the opposition were to hold EU-mediated talks Monday at the European Parliament. Macedonia declared independence from the dissolving Socialist Federal Republic of Yugoslavia in 1991. The country is an ethnic mosaic. Slavic Macedonians represent the largest group (64% of the population). Ethnic Albanians are the biggest minority (25%), with Turks (3%) and Roma (1.9%) also present. Integrating the ethnic Albanians has proved a cumbersome process, and the country has come close to civil war. The August 2001 Ohrid Framework Agreement, brokered by Western powers, halted the brinkmanship between the ethnic-Albanian communities (organised militarily in the National Liberation Army) and Macedonian forces. Of all the hurdles standing in the way of Macedonia's EU accession, the so-called 'name dispute' with Greece appears to be the biggest. Seen from Athens, the official name used by Skopje – Republic of Macedonia – is an open challenge to the Greek region of Macedonia. In reprisal, Greece pledged to veto Macedonia's participation in international organisations, including the EU, until the issue is resolved. Greece also considers that Skopje is misappropriating large chunks of its ancient history. Similarly, Bulgaria considers that Macedonia is cherry-picking heroes and glorious episodes from its mediaeval history and the 19th- and early-20th century struggle against Ottoman rule. Recently, Skopje angered Athens by erecting a giant statue of a ‘warrior on horseback’ resembling Alexander the Great in the centre of Skopje. Both nations claim Alexander as a native son.